Last Saturday, we went to Tesco around 11p.m after a satisfying dinner. At that hour, the parking lot was jam-packed. All the trolleys were not available. Most of the shelves were half-empty. It was so packed with people that we could hardly move forwards or backwards. I'm not complaining but thank goodness for their good prices, I say! The price of everything is going up and getting more expensive these days but who says people don't do well in tough economic time? Wow! Which Tesco is this Monica?? It does look like a riot...lolzz!! Saturday??? They Kiasu something might happen in the Protes. State of emergency maybe. hahaha..probably! and we were shocked too..
i agree! it does look like a riot, hehe. 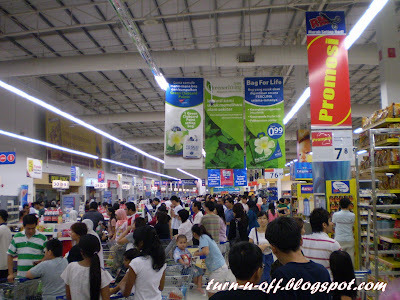 One thing about Malaysian, good times or bad times, they never fail to shop ... LOL!